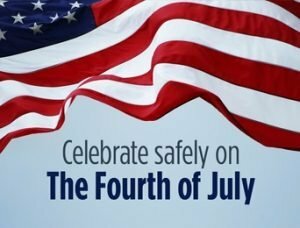 As the 4th of July Holiday approaches, The Norristown Fire Department would like to share some fireworks and grilling safety tips to residents. “The summer months are a great time of year for friends and family, said Norristown Fire Chief Tom O’Donnell. But we ask residents to use caution when celebrating. Fireworks can be fun and exciting, unfortunately emergency responders respond to firework related emergencies involving injury, property damage or worse.” We want people to know fireworks are not toys! On average 250 people go the emergency room every day with fireworks-related injuries in the month around the July 4th holiday. Fireworks related injuries are painful and their scars can last a lifetime. With the recent expansion of the Pennsylvania law to allow the sell of consumer grade fireworks, you need to know the facts. No one under the age of 18 is permitted to purchase fireworks. Fireworks cannot be ignited or discharged on a public or private property without permission of the property owner. Fireworks cannot be discharged from or within a motor vehicle or building, toward a motor vehicle or building or within 150 feet of an occupied structure. Finally, fireworks cannot be discharged while the person is under the influence of alcohol, a controlled substance, or another drug. Never allow children to play with or ignite fireworks, sparklers burn at nearly 1200 degrees and account for over one quarter of emergency room fireworks injuries. Equally as important is the safety around grilling during the summer months. The Municipal ordinance prohibits operation of all charcoal burners and other open-flame cooking devices on combustible porches, decks, and balconies or within ten feet of your home or business. At all times establish a three foot safety zone around all grills or open flame – no kids or pets should be allowed in that zone. Never use gasoline as an aide to ignite charcoal briquettes only use proper charcoal lighting fluid. Use the lighting fluid sparingly and NEVER PUT IT ON AN OPEN FLAME. More information about fire safety can be found on the Norristown Fire Department website at www.norristownfire.org or by contacting the Fire Marshal at 610-270-2894.